Challenge statement: How might we intervene in the prescription drug cycle to mitigate abuse and addiction? Our solution, Secure, combines a computer interface for doctors to use to monitor their patients and a smart pill bottle that is used by patients. The goal of our solution is to aid doctors understand when a patient might be showing signs of addiction to their medications and intervene. A secondary goal is to make sure no one else but the patient can access their medication. The Secure pill bottle uses a fingerprint sensor that is used to assign the bottle to the prescribed patient. The fingerprint scanner prevents others from stealing the patient's medication. When the patient squeezes the bottle, biometric sensors on the bottle detect the user's blood pressure and heart rate, two bio signs that are affected by addiction. The bottle also contains a pill dispenser inside that only dispenses the right number of pills as prescribed by the doctor. The goal with all these sensors and control mechanisms is to prevent patients from taking more pills than required and to detect signs of addiction before a patient becomes addicted. Each person on the team conducted research and found several articles, documentaries, and resources on drug abuse and the opioid epidemic. It was through our research of the opioid epidemic where we learned what the problems were. Some of these problems include the fact that people often start on the path toward opioid addiction by starting on opioid pain medication that is prescribed to them after a medical procedure. Using these medications can lead to a reliance on them which then can lead to addiction. Patients often fall into addiction without realizing it. After exhausting our research through white papers, documentaries, and articles, we began recruiting people to interview to learn even more about the problem space. We recruited and interviewed 7 medical professionals and 2 recovering/recovered drug addicts. We also had each participant tell us stories about their own experiences. My contribution here was to interview 4 of our participants including 3 medical professionals and 1 recovering addict. Once we were done with our interviews, we began to create an affinity diagram to synthesize our research. Before we even began to synthesize our research, one important insight that I gained from the interviews was that addiction is hard to monitor. In most cases, the doctor and patient don't realize that addiction has occurred until it is too late. After the interviews were done, we began the process of synthesizing our research data. Each of team member listened to 3-4 interviews, transcribed them, and coded them. We then synthesized our research using the affinity diagramming process. 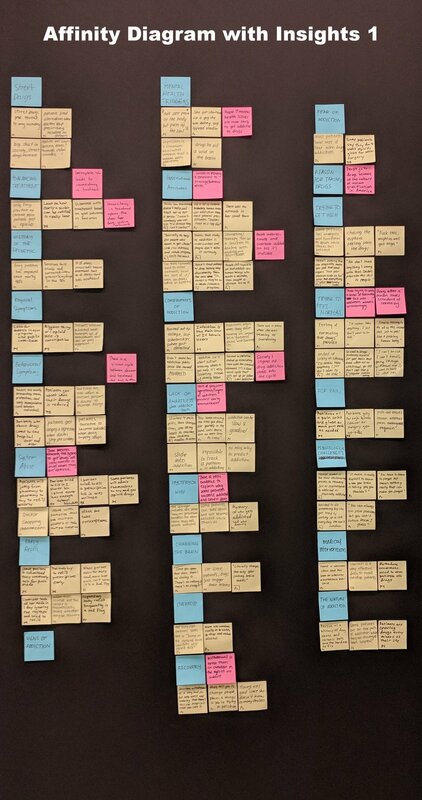 This process aided us in grouping together common data points, finding themes (blue stickies), and developing our insights (pink stickies). This step was crucial in our design process since it helped the team understand what issues there were, and what possible solutions could be designed. The 9 insights below are what our team came up with after analyzing our mountain of data. We originally had 11 insights separated into 4 categories. We then narrowed it down further into 9 insights. Based off the insights below we came up with our design principles that we followed to create a design solution for our problem. The insights helped us figure out the areas of our problem that we could tackle. The isolating nature of addiction encourages associations with criminals and fosters criminal behavior. These principals aided us in choosing which design interventions to go with after we had each brainstormed several ideas. The next step in our process was to take the insights and design principles that we developed and come up with possible design solutions. To do this, we had a brainstorming session with 2 other groups in our class and shared out our ideas. My team and I then narrowed down our ideas to 6 ideas, each of us sketching out 2 ideas. Our ideas didn't have to be feasible, so we came up with concepts that were practical and not practical given today's technology. The biometric clothes and nanites were my ideas. The core idea behind my concepts was to develop a way for doctors to monitor their patients more closely and intervene when they notice a patient might be on the path toward addiction. After my teammates and I shared our ideas, we noticed each of our ideas contained an aspect of monitoring the patient's bio signs. We also agreed that incorporating the pill bottle idea that had a fingerprint sensor would be a good element to incorporate into our design since we wanted to make sure only the patient with the prescription was taking the medication given by the doctor. Our final idea that we came up with was a pill bottle that would regulate a patient's medication, while also using biometric sensors to monitor the patient's heart rate and blood pressure since those two biometric values are affected by opioid use. Our goal with our design was to help doctors keep track of their patients and notice the warning signs of addiction sooner so that they can intervene. We created an initial prototype of our system, which we called Secure, and tested it with 4 participants. Our team used the "Wizard of Oz" prototyping method for to validate our idea was plausible to users and to gain insight into what users thought of the concept of a pill bottle that would regulate their dosage for them. In this testing method, we told users that our prototype was sensing their bio signs and fingerprints. It really wasn't working, but due to time constraints, we didn't have time to make a working prototype, so we faked that our idea worked to get feedback from our participants. From the Wizard of Oz user testing we learned some valuable lessons on how to improve our design such as how to get people to hold the pill bottle in a way we wanted. The way we had envisioned people holding the bottle was with their hand wrapped around the bottle shown below and twisting the cap off with their other hand. The way our participants actually held it was with their thumb and a couple of fingers. To pick up the biometric values we wanted to, we needed participants to hold the bottle with their whole hand. In our final design we picked a bottle design that forces the user to hold the bottle with their whole hand so that they can squeeze it open. By having the user hold the bottle with their whole hand and squeeze, the bottle would be able to pick up the bio signs we wanted. The Prototype of our design. Image credit to theresa. During the first 6 weeks of the research phase of the quarter, my teammates and I had to recruit at least 8 people to do semi-structured interviews and storytelling activities with. At first, I was hesitant to contact busy professionals who wouldn’t have any real incentive to help students with a project. However, after talking with my group members, we approached potential participants in pairs, and we reached out to people we knew via Facebook. I found that people were willing to help students, and that if it’s a topic the person is passionate about, they are willing to help for free. On the topic of recruiting people, I learned that it is extremely important to recruit people early. With how busy many people are, if my team and I hadn’t recruited early, we would not have been able to meet the deadline for having our interviews done by the 6th week of our class.